Unlike Dead Cell’s plucky protagonist – a failed alchemist, incarcerated under mysterious circumstances – developer Motion Twin has successfully managed to forge solid gold by skilfully combining all the right raw elements. 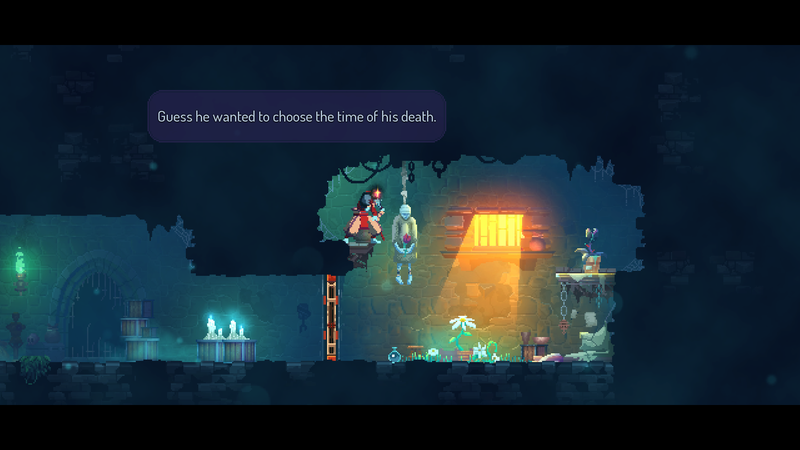 It takes ideas from games as old as Metroid and Castlevania, mixes them with modern-day classics such as Dark Souls, and adds a few innovations of its own. The amazing thing about this, is that every single element feels like it has been tinkered with, refined and then polished to perfection. If Motion Twin told us they had spent just as much time playtesting and fine tuning as they had programming and coding, we’d believe them without question. At its heart, it’s a 2D action platformer with randomised levels and permadeath. One shot to escape the constraints of the town’s prison, and its equally dank surrounding areas, is all you get. Once you die, it’s a case of starting all over again. It may sound like an impossible task, but with each new weapon, secondary item and passive skill purchased, chances of survival increase. For instance, after investing a small number of souls, sorry – cells, it’s possible to start a new adventure with a weapon other than the basic rusty sword, along with a moderately sized bag of cash. It doesn’t take long for the Metroid and Castlevania influences to show. From Metroid it borrows the labyrinth-like level layouts and permanent upgrades that allow access to new areas, with the first being climbable vines. As for Castlevania, a few whip-like weapons soon become available, while the most common enemies are festering zombie-like creatures. Also like the later Castlevania games, combat is fast-paced and delightfully crunchy, with enemies exploding into a shower of guts and gore. If you’re lucky, they’ll drop a nifty new weapon, or perhaps a blueprint, too. 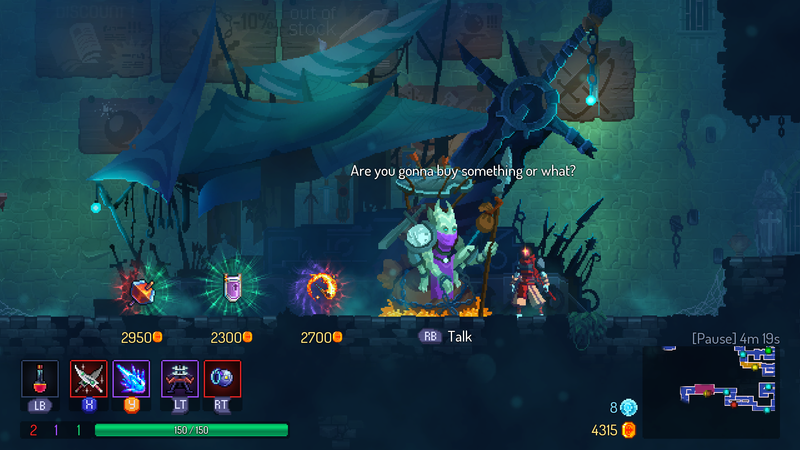 Loosely sticking with the theme of luck, Dead Cells isn’t a game that constantly stacks the odds against you. It’s tough, but also respectful of your time and efforts. After spending an hour or two with it, you’ll soon start to notice subtle twists Motion Twin has implemented to keep things fresh, as well as additional ways to give you a bigger shot at success. Even when sprinting through the first few stages some half-a-dozen attempts later you may come across a new backstory-expanding set-piece. Alternative paths help speed up progression, meanwhile, making it possible to avoid areas that have previously lead to your demise (the Toxic Sewer isn’t particularly newcomer friendly), and sometimes just went you think the fight is over, an enemy may drop a high-level item or a much-needed health pick-up. Occasionally optional risky endeavours are thrown your way too, in the form of curse-bestowing treasure chests. Do you play it safe, or risk it all for a bumper booty? There are even times – usually during the opening stages – where it’s possible to feel stupidly overpowered, taking down the larger enemies with just two or three hits. Enjoy it while it lasts – after the first boss, reachable after making it through three or four stages (path depending), the difficulty level rises sharply. From thereon in, it’s often a case of exercising caution, using secondary weapons such as turrets and grenades – which have pleasingly brief cooldown rates – and praying the doorway to the next area isn’t on a path heavily guarded by foes. What really impresses, though, is the level design. Each stage is randomised in a rogue-like fashion, yet still has that all-important feel of being crafted by hand. Moreover, each location feels suitably different from the last, having their own hazards. Dead ends, unreachable areas, and rooms over packed with enemies are – from our experiences at least – very seldom seen. You’re free to explore – making sure every shop, stat upgrade, and all new weapons have been discovered – or zip through things as fast as possible. The likeable lead is resoundingly nimble, able to roll out of harm’s way in a blink of an eye, and sprint along corridors. Secrets await those fast on their feet, in the form of timed doorways. 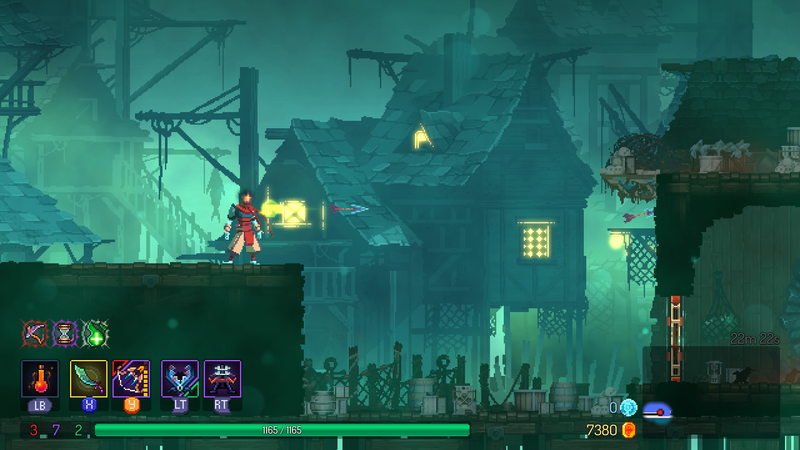 This is just one of Dead Cell’s hidden depths; one that changes the way you both think and play. To find fault with Dead Cells is no easy task. The pixel-art is exemplary, the controls are resoundingly responsive, and above all, getting a little further with every passing attempt feels immensely satisfying. This is very much an experience that rewards for past efforts, no matter how minor. While some gamers may blitz through it quicker than others, all and sundry will have a different story to tell come the grand finale. Stories of determination, moments of temporary jubilation, and eventual glory. Come revel in Dead Cell’s magic and forge your own magnificent tale.